This cutaway view of Saturn’s moon Enceladus is an artist’s rendering that depicts possible hydrothermal activity that may be taking place on and under the seafloor of the moon’s subsurface ocean, based on recently published results from NASA’s Cassini mission. Hydrothermal activity is a process where seawater infiltrates and reacts with a rocky crust, emerging as a heated, mineral-laden solution. This is a natural occurrence in Earth’s oceans. Researchers think microscopic grains of rock detected in the Saturn system by Cassini most likely form when hot water containing dissolved minerals from the moon’s rocky interior travels upward, coming into contact with cooler water. Temperatures required for the interactions that produce the tiny rock grains would be at least 194 degrees Fahrenheit (90 degrees Celsius). On Earth, the most common way to form silica grains of the 6-to-9-nanometer size found by Cassini is hydrothermal activity involving a specific range of conditions. Namely, when slightly alkaline, slightly salty water that is super-saturated with silica undergoes a big drop in temperature. Gravity science measurements from Cassini also suggest Enceladus’ rocky core is quite porous, which would allow water from the ocean to percolate into the interior. This would provide a huge surface area where rock and water could interact. Cassini first revealed active geology on Enceladus in 2005 with evidence of an icy spray issuing from the moon’s south polar region and higher-than-expected temperatures in the icy surface there. With its powerful suite of complementary science instruments, the mission soon revealed a towering plume of water ice and vapor, salts and organic materials that issues from relatively warm fractures on the wrinkled surface. Gravity science results published in 2014 strongly suggested the presence of a 6-mile- (10-kilometer-) deep ocean beneath an ice shell about 19 to 25 miles (30 to 40 kilometers) thick. “It’s very exciting that we can use these tiny grains of rock, spewed into space by geysers, to tell us about conditions on — and beneath — the ocean floor of an icy moon,” said the paper’s lead author Sean Hsu, a postdoctoral researcher at the University of Colorado at Boulder. Cassini’s cosmic dust analyzer (CDA) instrument repeatedly detected miniscule rock particles rich in silicon, even before Cassini entered Saturn’s orbit in 2004. By process of elimination, the CDA team concluded these particles must be grains of silica, which is found in sand and the mineral quartz on Earth. The consistent size of the grains observed by Cassini, the largest of which were 6 to 9 nanometers, was the clue that told the researchers a specific process likely was responsible. “We methodically searched for alternate explanations for the nanosilica grains, but every new result pointed to a single, most likely origin,” said co-author Frank Postberg, a Cassini CDA team scientist at Heidelberg University in Germany. The extremely small size of the silica particles also suggests they travel upward relatively quickly from their hydrothermal origin to the near-surface sources of the moon’s geysers. From seafloor to outer space, a distance of about 30 miles (50 kilometers), the grains spend a few months to a few years in transit, otherwise they would grow much larger. The authors point out that Cassini’s gravity measurements suggest Enceladus’ rocky core is quite porous, which would allow water from the ocean to percolate into the interior. This would provide a huge surface area where rock and water could interact. The team found that, at the high pressures expected in the moon’s ocean, icy materials called clathrates could form that imprison methane molecules within a crystal structure of water ice. Their models indicate that this process is so efficient at depleting the ocean of methane that the researchers still needed an explanation for its abundance in the plume. 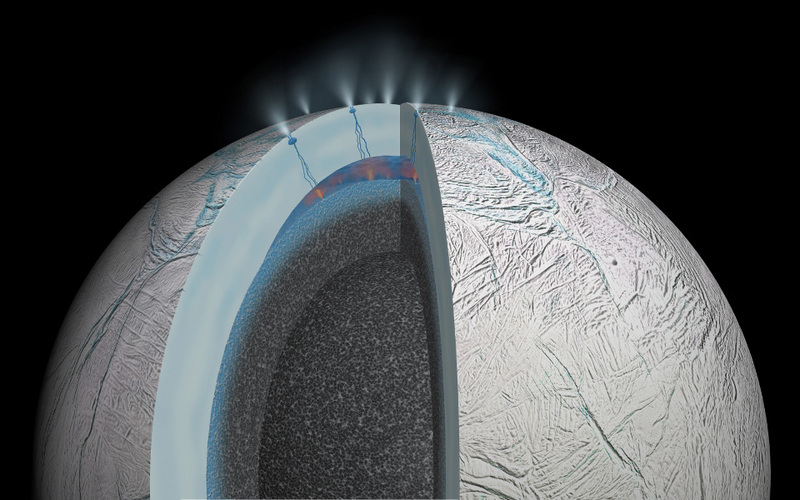 “We didn’t expect that our study of clathrates in the Enceladus ocean would lead us to the idea that methane is actively being produced by hydrothermal processes,” said lead author Alexis Bouquet, a graduate student at the University of Texas at San Antonio. Bouquet worked with co-author Hunter Waite, who leads the Cassini Ion and Neutral Mass Spectrometer (INMS) team at Southwest Research Institute in San Antonio. Cassini first revealed active geological processes on Enceladus in 2005 with evidence of an icy spray issuing from the moon’s south polar region and higher-than-expected temperatures in the icy surface there. With its powerful suite of complementary science instruments, the mission soon revealed a towering plume of water ice and vapor, salts and organic materials that issues from relatively warm fractures on the wrinkled surface. Gravity science results published in 2014 strongly suggested the presence of a 6-mile- (10-kilometer-) deep ocean beneath an ice shell about 19 to 25 miles (30 to 40 kilometers) thick. The Cassini-Huygens mission is a cooperative project of NASA, ESA (European Space Agency) and the Italian Space Agency. NASA’s Jet Propulsion Laboratory in Pasadena, California, manages the mission for the agency’s Science Mission Directorate in Washington. The Cassini CDA instrument was provided by the German Aerospace Center. The instrument team, led by Ralf Srama, is based at the University of Stuttgart in Germany. JPL is a division of the California Institute of Technology in Pasadena.